Yesterday I completed some new pleated shoulder bags. I really love this new design. 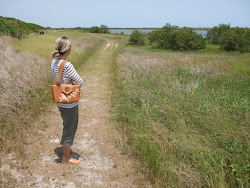 Posted above is me modeling one of the new pleated bags. I'm standing near the east river in New York City with a view of the United Nations building in the background. 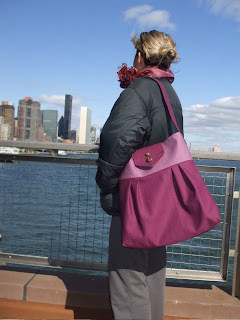 The bag above is made from cotton twill in plum and lilac. 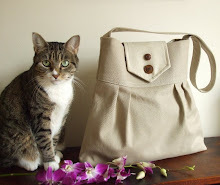 I find that cotton canvas and twill works best with this design. I used the same fabric on the outside for the inside lining. Since the fabric is soft but thick I do not need to interface it. I found that using interface made the pleats looks stiff and unnatural. This designs looks best when the pleats are soft and flowing. I did interface the top band which helps the bag hold its shape. 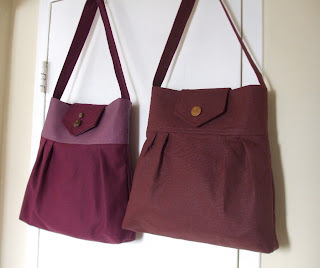 The handbag posted below on the right is made from a beautiful linen and cotton blend fabric in a deep wine color. Since this fabric is a bit thinner than the cotton twill I decided to interface the inside lining to give the bag more shape yet keep the pleats on the outside soft and flowing. I think they both were a success. They will be available in my shop sometime this week. Plum, lilac and all shades of purple are very in fashion for the fall and winter. hint hint!